Koizuka “teased” the arrival of new weaponry. “Speaking of combat, there are new weapons in play. 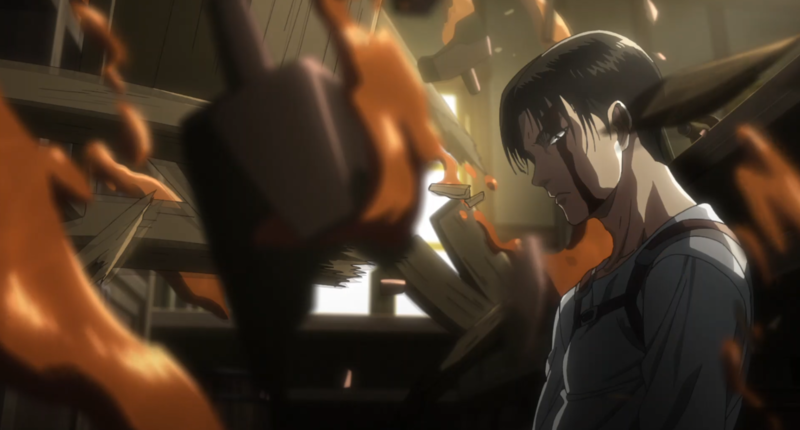 That weapon will become the responsibility of someone from Episode 49.” While I thought the pacing and focus on story was a refreshing change to the series and fighting and killing humans instead of Titans created an interesting conflict, I did start to miss the harrowing fights between Titans and humans. Of course I also believe that the second half of the season will feature deaths of some of our favorite scouts. The massive titan of Rod Reiss continues to drag itself toward Orvud District. 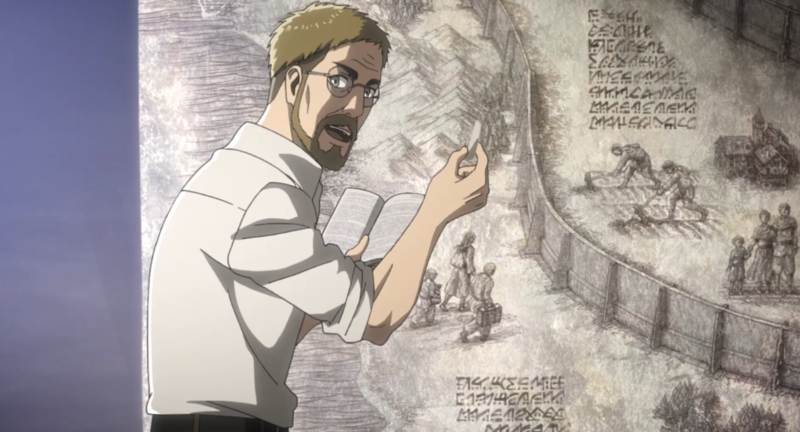 Erwin’s plan becomes more clear as Hange explains why it would be a bad idea to evacuate the citizens. Because Rod is an abnormal Titan he would be drawn to a larger crowd of people. If they evacuate it simply will change direction, potentially destroying the wall itself and killing more people. 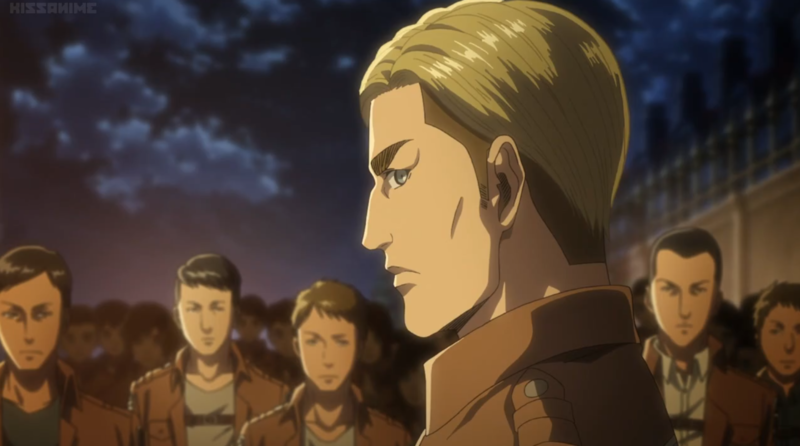 Erwin acknowledges that the scouts are duty bound to protect the citizens and that even though they will use them as bait, they have developed a plan to save them if needed. The scouts will have the citizen participate in a “emergency evacuation drill.” They begin in the morning, but the citizens aren’t interested. They complain and question the authority of the scouts. Considering their attitude I can only conclude that these people haven’t been exposed to the Titans much. Regardless, they quiet down as they notice the smoke coming from Rod’s Titan form. Cartsen orders the scouts to shoot Rod with cannon’s from a top of Wall Sina. This goes as well as I expected, which is to say not very well. Erwin has a seemingly ridiculous plan that of course is going to work. As Titan battles tend to go this one wasn’t the most action packed, but it made up for it by being the most disgusting. Rod having been crawling with half his face buried in the ground and well as his stomach, no longer has either. His entrails fall out on top of Wall Sina. Finally, the citizens see the Titan and begin to flee. From this point the main scouts take over. After blowing up gunpowder near the Titans hands, it falls over. 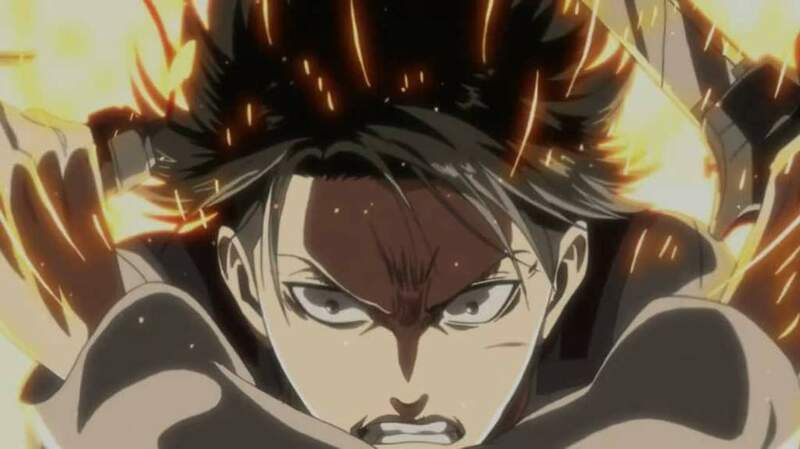 Eren carrying barrels of gunpowder, literally throws it into the Titans face. The heat causes them to blow up, resulting in an chain reaction that destroys the top half of Rod. Piece’s of the Titan fly off and Erwin order’s the Scout’s to cut up the chunks. 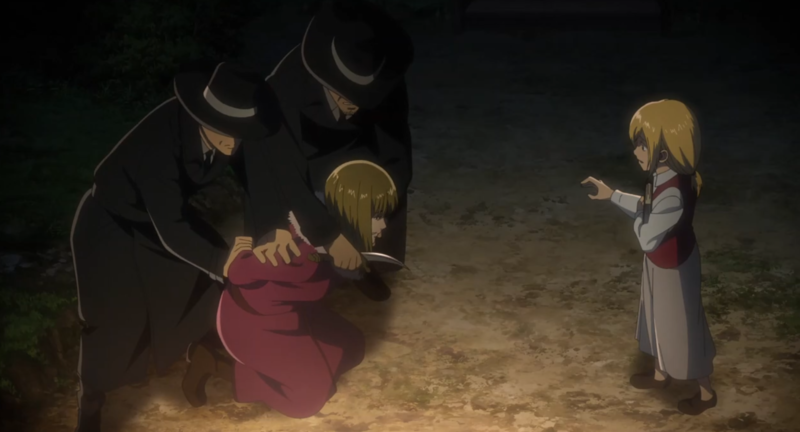 The Scouts do so with Historia finally delivering the death blow to her father. We finally see the results of what happened to Kenny and his squad. He appears to be the only survivor and is fatally wounded. Levi and another soldier find him sitting against a tree. 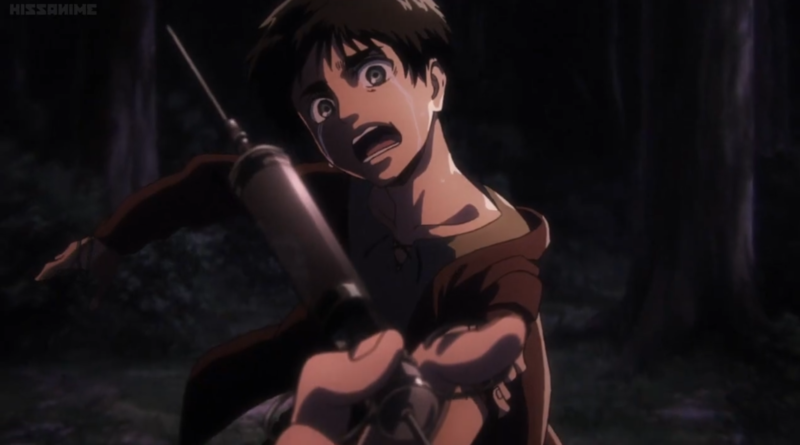 As Levi noted his likely fate is death, Kenny shows him a syringe. There’s no way that this series will have another human made Titan so close to Rod. I think Kenny dies before he can use it or he gives it to Levi to use. The action in this episode was simple and mostly secondary. 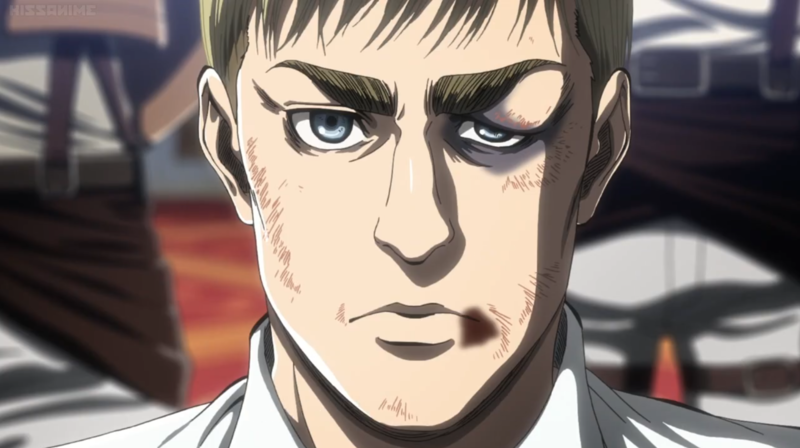 This episode was largely about the character growth of Historia and Eren. Eren realizes that he was too arrogant. 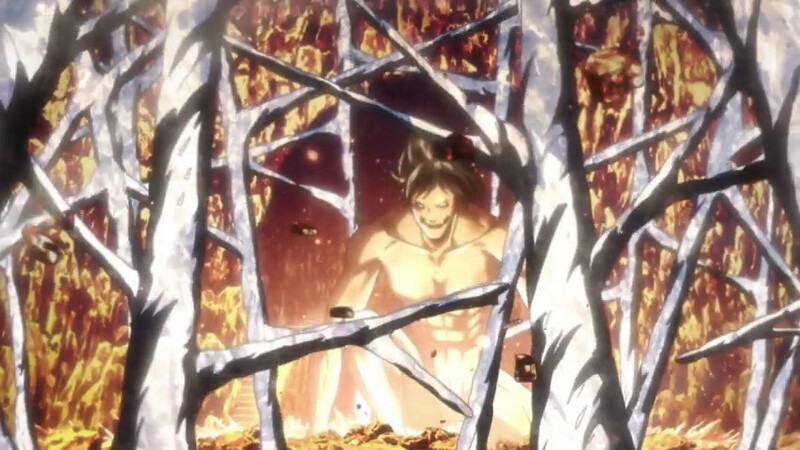 He seems to come to terms with the fact that despite his Titan abilities he’s not the “main character.” Eren of course remains very important to the series but it feels like he’s at peace with his place in the Scouts (and hopefully the series). I still think Historia’s transformation was too quick and not earned like Eren’s, but it will be good to see them accept themselves. 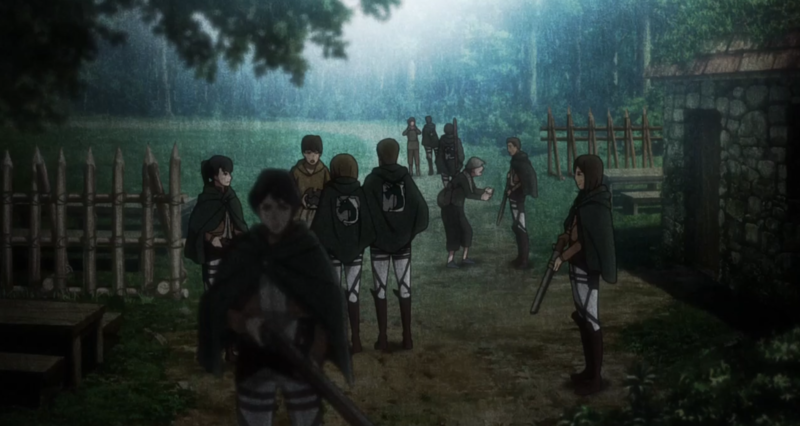 With Historia now Queen, the scouts have a powerful ally, while killing off almost all of their non Titan enemies. A perfect time to head to the basement. Rod Reiss gives Historia hope that she can “meet” her sister. He claims that she’s not “entirely dead” he takes out a syringe that Eren quickly recognizes and begins to panic. Meanwhile, the scouts begin their assault on Chapel and the Anti-Personnel Control Squad. The doors open, then the scouts roll barrels of gunpowder down the stairs. Levi and the other enter. Sasha uses her bow and arrow skills to shoot the barrels with fire arrows. Using signal flares, they are able to create a smokescreen. Levi quickly counts the numbers of Anti-Personnel Squad-members (35). 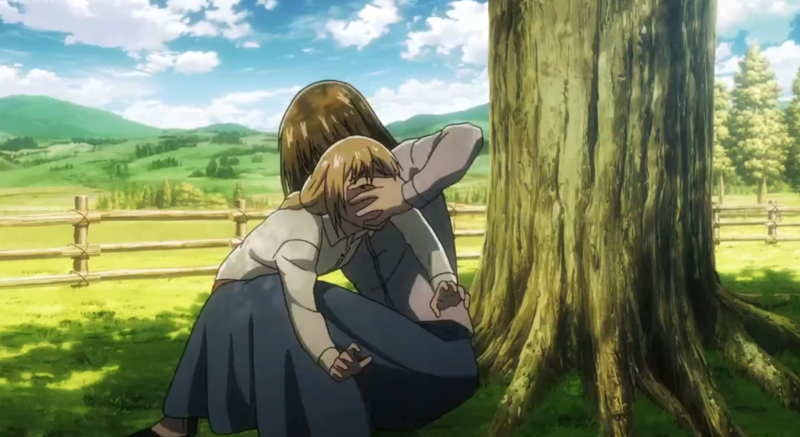 Armin informs the others of the weakness of their Anti-Personnel ODM because it “requires that they fire in the same direction they intend to shoot their anchors, so they are unable to attack someone directly behind them.” Jean and Conny both get their first human kills, signalling a major change in the series as particularly Jean was apprehensive to do so. 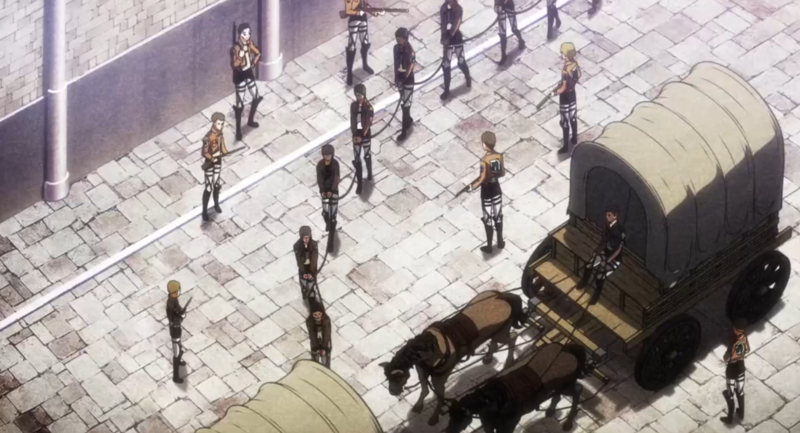 Unsurprisingly, Mikasa and Levi overwhelm the Control Squad, taking out several of them each. 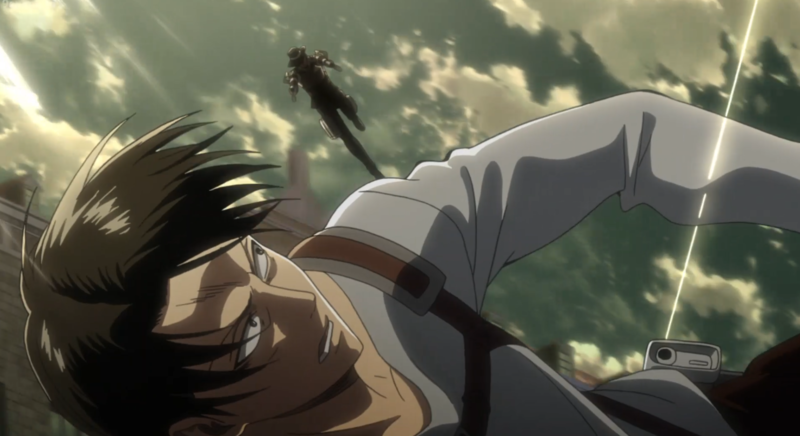 Kenny attacks Levi, who then manages to wound Kenny in the stomach. Kenny flees. Hange approaches Caven. 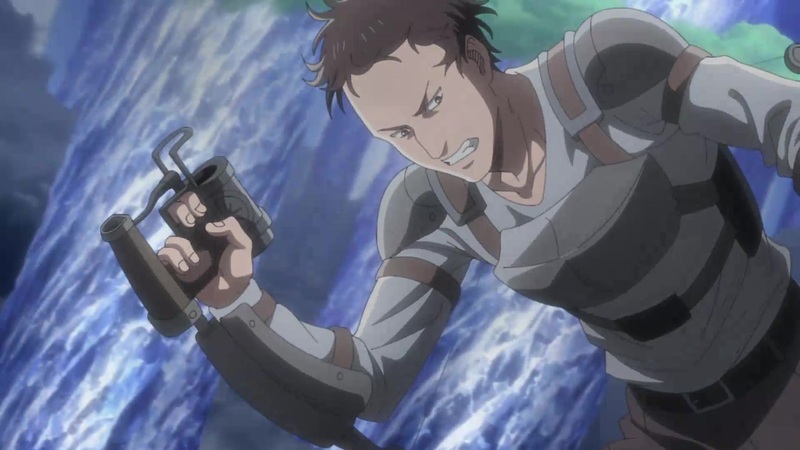 She manages to shoot Hange in the shoulder with her ODM gear piercing Hange’s shoulder. 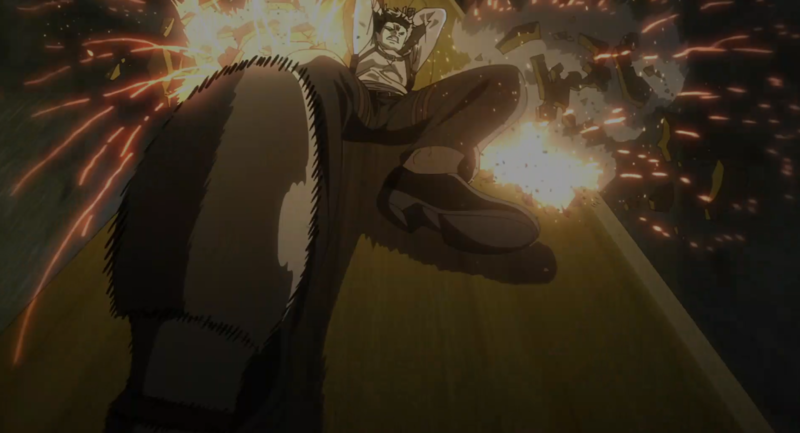 She then throws Hange against one of the crystal pillars. 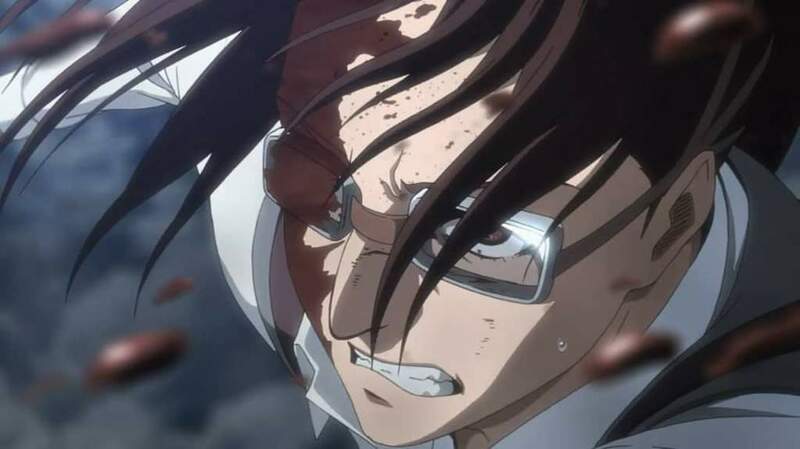 While, Attack on Titan is know for killing off main characters, I don’t think THIS is will be the moment that Hange will die. Caven takes this moment to flee with her squad. We finally get to see what happened in the past. 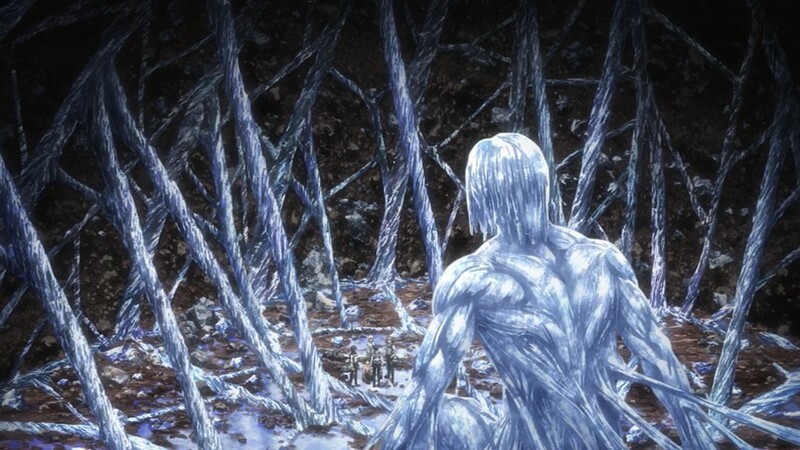 Basically, a titan created the cavern, the 3 walls and altered peoples minds. When Frieda was 15 she ate her uncle and inherited the Founding Titan and memories of the of the old world. This process has been repeated over and over in the Reiss Family. 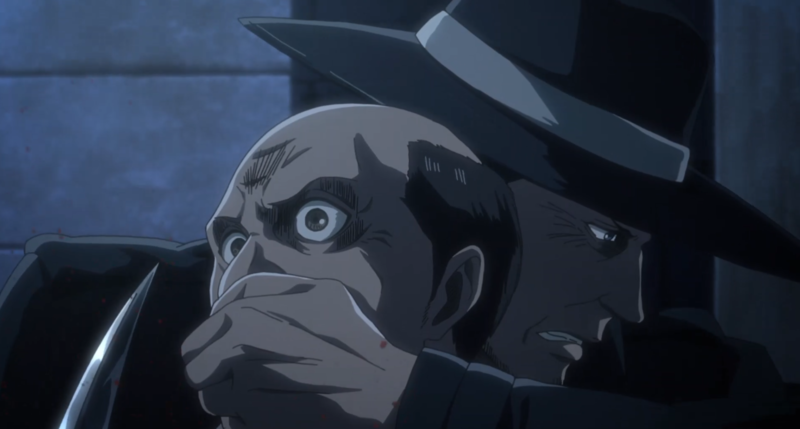 He claims that Grisha stole this power from Frieda and “gave” it to Eren, who lacks the Reiss blood and cannot make it work properly. If it’s not obvious, Rod is clearly a coward. He positions himself as some sort of steward of his families control over the titan power. Considering how quickly he goes to get his Historia after his families massacre is questionable. Regardless, Rod encourages Historia to inject the syringe and become a titan and eat Eren. She’s hesitant and realizes that Eren hasn’t transformed yet. 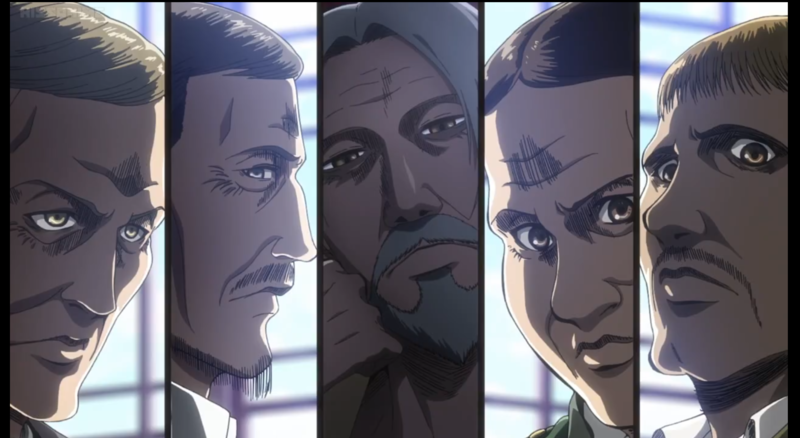 She asks him why and Eren begins to cry and explains that “they would not be in this position if his father had not come here five years ago.” He recalls all the “costs” that Frieda’s death resulted in. 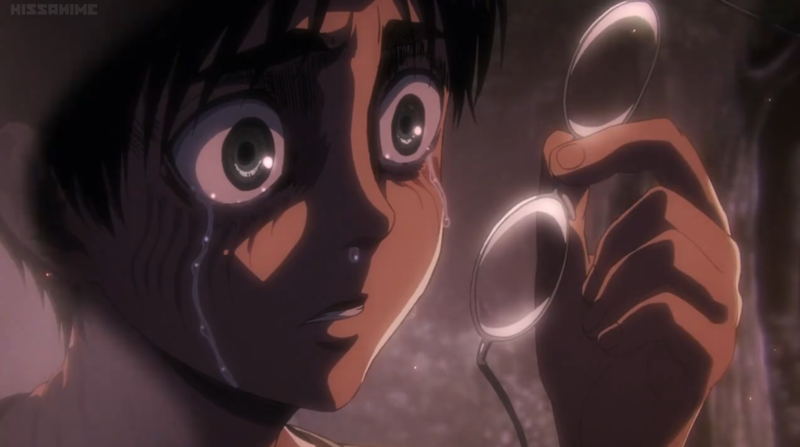 Eren has his moments in this series and sometimes if find his emotional complexity endearing. However, he can be needless self-deprecating and it can become annoying. 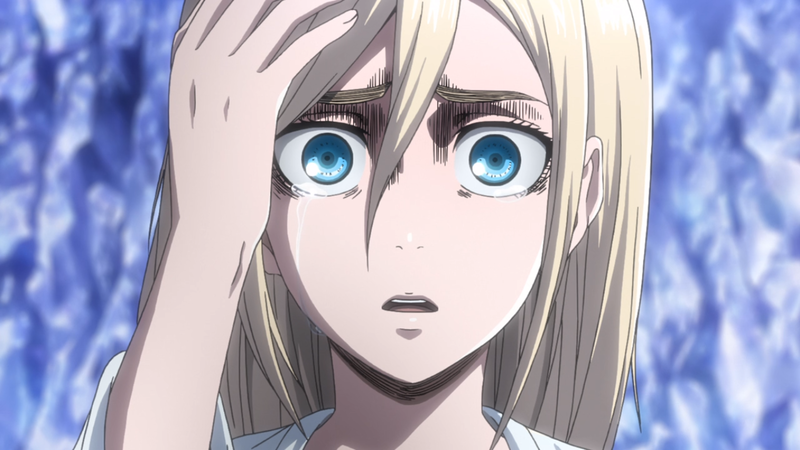 Historia changes her mind as she remembers Ymir. She throws the syringe to the ground and begins to free Eren as he begs her to eat him to stop everyone’s suffering. She pulls out the first set of chains as she tells him that “that she wants nothing to do with exterminating the Titans. Let humanity get wiped out.” Rod begins to crawl his way toward the puddle and licks it, turning himself into a Titan. I’m glad to see Historia come to he senses. 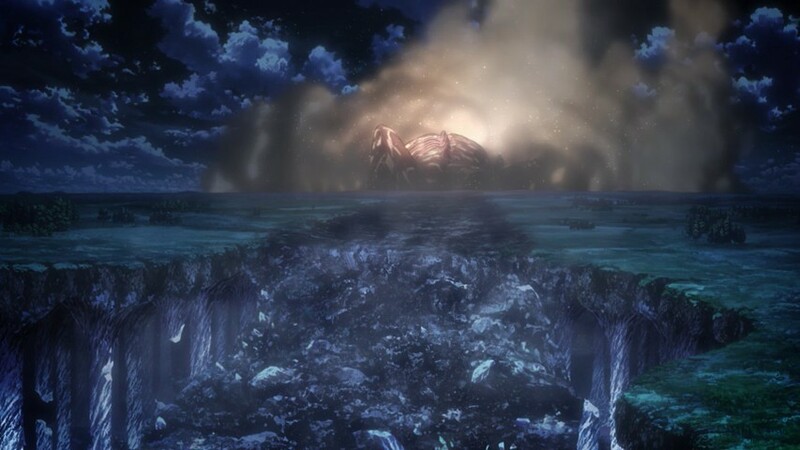 I predict that Eren should transform to save himself from Rod, but in the state that he’s in maybe not. I’m assume of course that Rod would be a mindless Titan, which could mean that he attacks Kenny and the control squad as well. 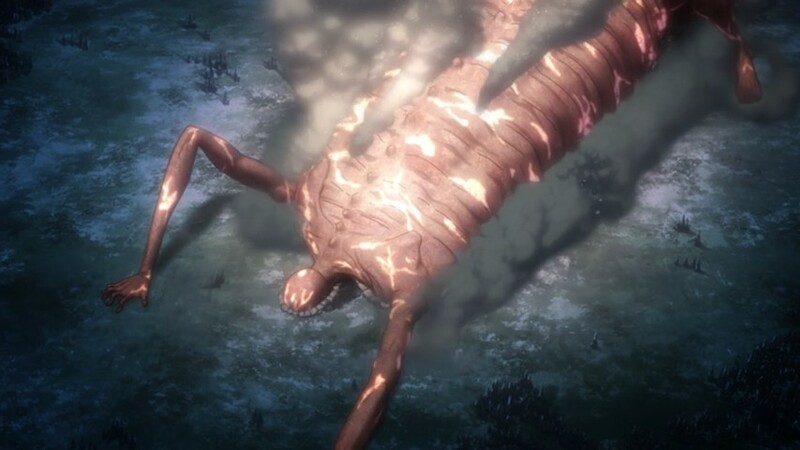 Being an “ordinary” titan should make him easy to kill anyway. 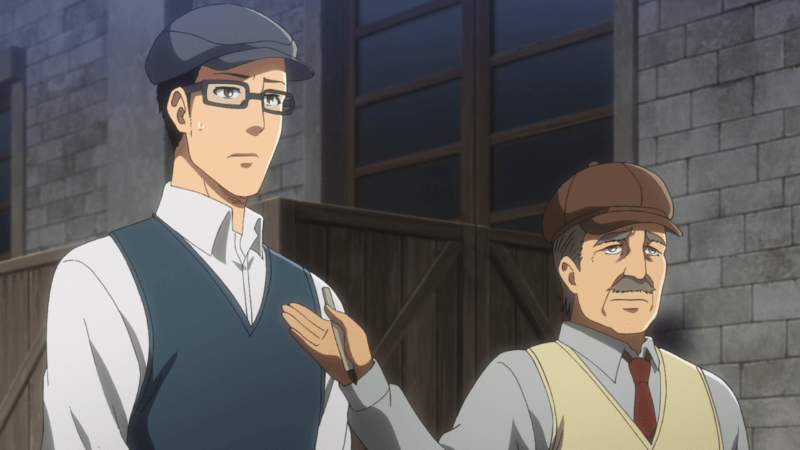 The last episode of Attack on Titan was important to expanding the background of characters Erwin and Historia. It also was dark, draining any since of hope from the series. This episode injects some hope back into it. Marlo Freudenberg and Hitch Dreyse are searching for the scouts in the woods, Marlo questions why the scouts would kill a civilian and flee. 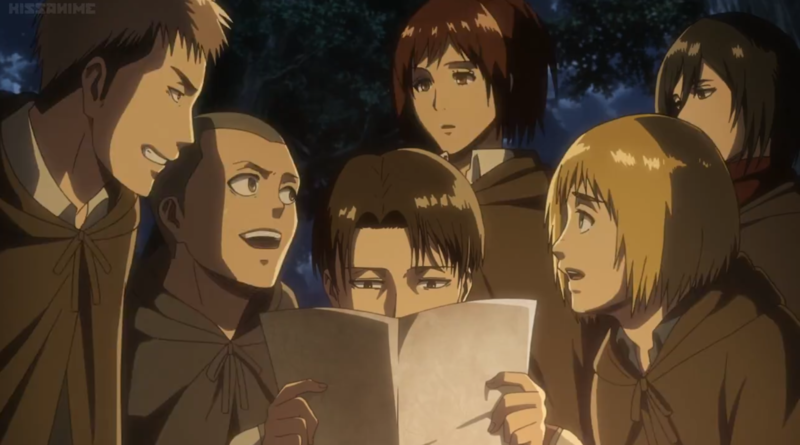 Considering the fact that they always risk their lives for humanity against the Titans. If you don’t remember, Marlo and Hitch were featured earlier in the series, in episode 23, entitled Smile: Assault on Stohess, Part 1. In that episode Marlo claims to have joined the Military Police “to uphold justice and do what’s right.” He’s mocked for this goal by Hitch, but seems sincere when he tries to stop some of superiors while they illegally sell ODM gear. 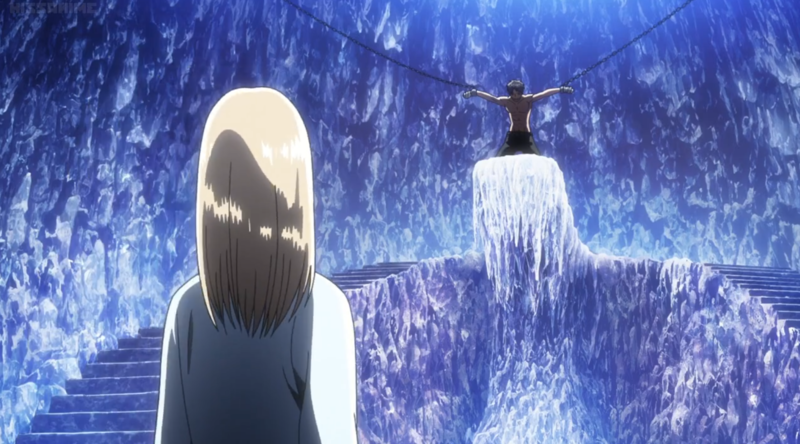 Anyway, They see Armin taking water from the river. 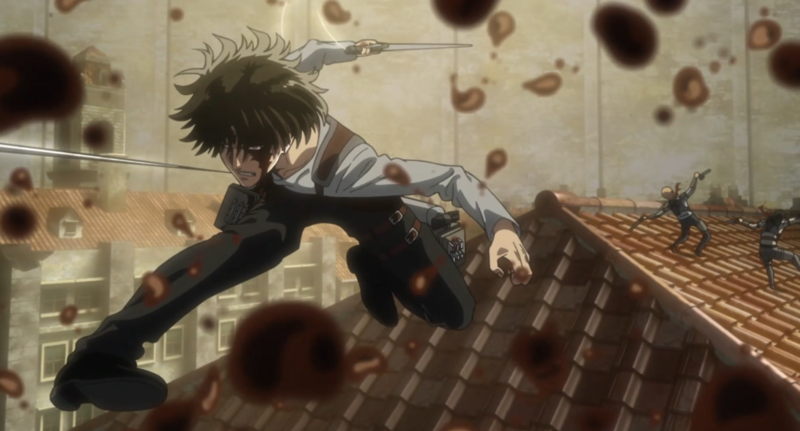 Taking the bait when he surrenders, they are quickly ambushed by Mikasa and Levi. Marlo represents the theme of this episode the governments “truth” is starting to unravel. Nile Dawk tells two journalists that “judging by the evidence,” the scouts did kill a civilian. The younger journalist seems to be more interested in getting all the details, but is cut off by the older one. Dawk shows a concern that the new ODM gear is “perfect for killing people,” in particular scouts. He concludes that the Military Police will likely find themselves staring down their guns eventually. 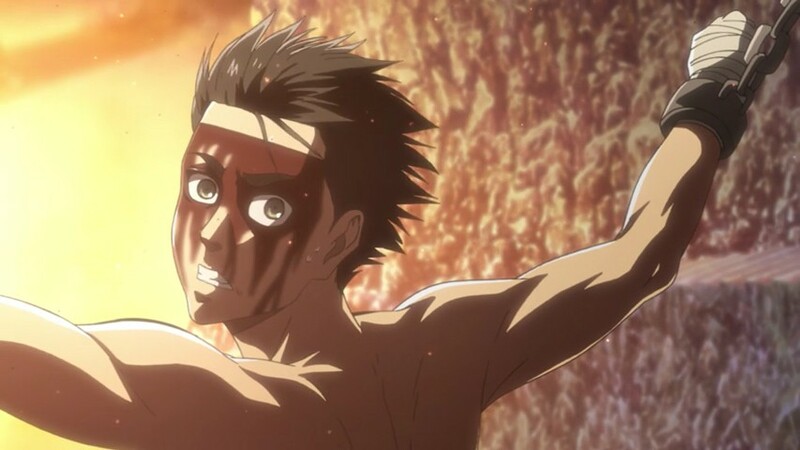 Flegel Reeves is being chased by the Military Police, he’s chased into a dead end alley, but is rescued by Hange. She tries to get him to stand up against the government, which he is unwilling to do. 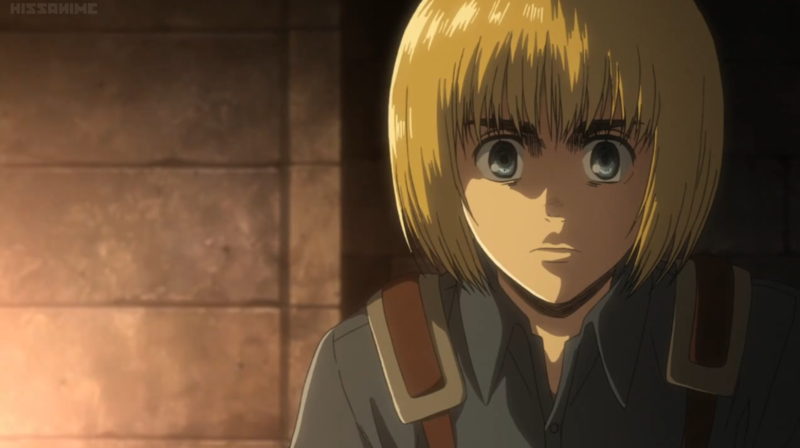 Hitch is still concerned about Annie going missing, Levi informs her that Annie was the Titan. He decries the fact that ” Nobody knows a damn thing about this world . . . Not us or anyone else.” This is true of course, but is also the goal of the government. The government deliberately miss informs and keeps secrets from the Military Police and civilians. They can’t stop something if you don’t know what going on right. Marlo asks to join Levi, but he’s rebuffed. Jean asks to tie them up himself, he “attacks” them. I’ll admit that considering Attack on Titans dark theme’s and event that have transpired, I almost thought Jean was going to kill them. However, Jean has always represented the humor in this series (along with Hange). He mocks Marlo for his terrible ” Bowl cut” hair style. Marlo quickly understands that it was a test. Marlo and Hitch aid the scouts in finding the checkpoint, and are told to return to their squad. The scouts take the checkpoint, taking the leader. 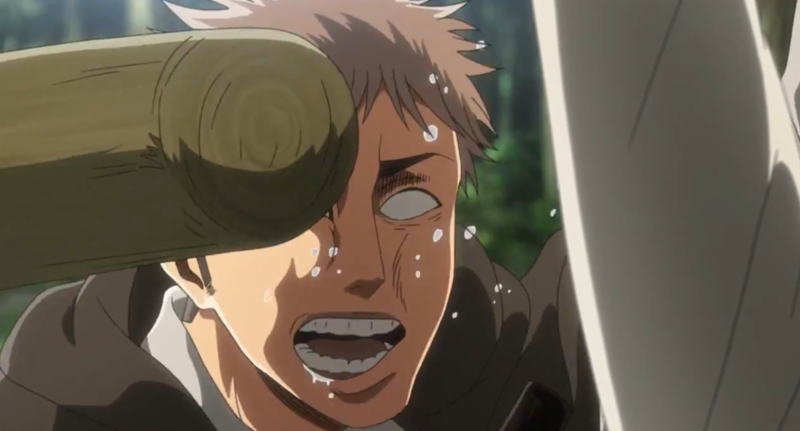 Levi tortures him but only learns the last name of Kenny, Ackermann. Which is also the last name of Mikasa. 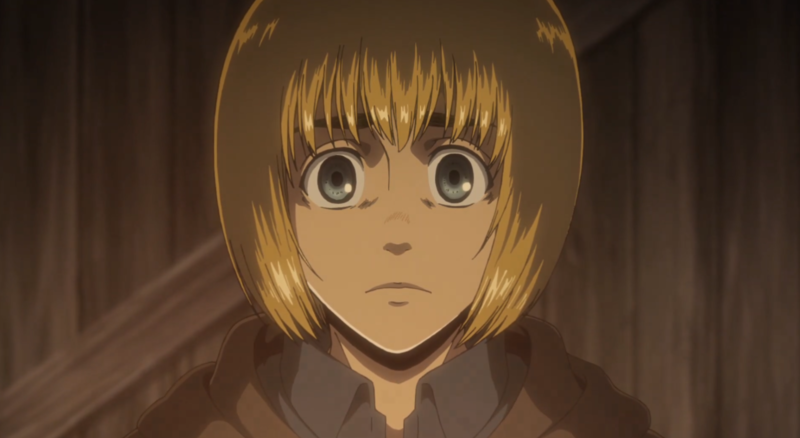 There’s no way that she’s not related to Kenny, the question I have is Levi related to her as well. Finally, Flegel gets “caught” by the Military Police. He gets them to give him a death wish, tell him why his father was killed. It was obvious that he would get the Police to reveal what really happened, but I was surprised that so many civilians witnessed it, as well as the previously mentioned journalists. However, can Flegel be the boss if the Military Police and the government know he’s a witness? Won’t they kill him and all the civilians anyway? Maybe the civilians, journalists and the Reeves family can start a resistance within the walls. 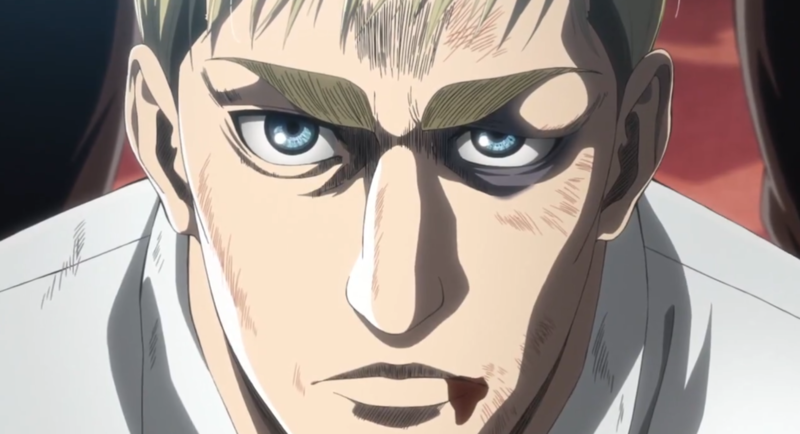 The episode ends with Erwin telling Dawk that “When, and if the time comes, he will only watch,” and that “it’s up to you (Dawk) to decide. 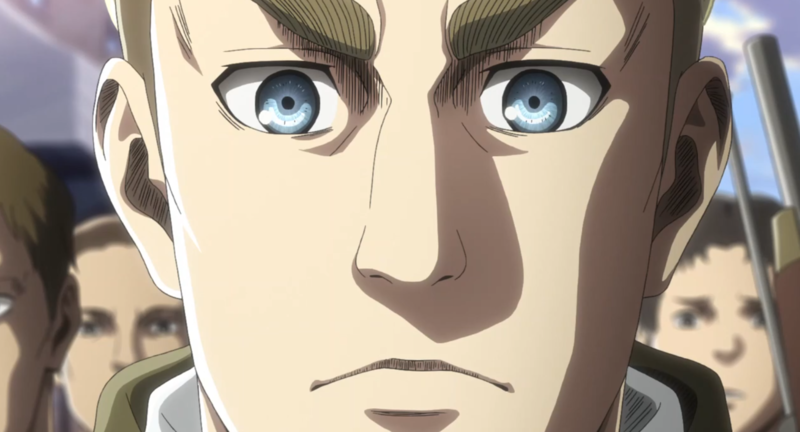 You and them.” Erwin is clearly going to be heading for execution the question is will it happen?